Could your dog or cat become a blood donor and save lives? Just like humans, pets can suffer from life-threatening illnesses such as anaemia, toxicity, trauma or severe injury that could result in them needing a life-saving blood transfusion. U-Vet Werribee Animal Hospital’s Canine and Feline Blood Donor Programs constantly are in need of blood donations to ensure blood products are readily available for immediate use for critical ill pets in our care. To determine if your pet is heathy and eligible to donate we need to complete a full physical examination including a temperament test and comprehensive blood screening. The tests will verify whether your pet is healthy and in no danger to give a blood donation. The blood donation will be collected from a vein in your dog’s neck and takes approximately 20-30 minutes to donate so it is important for your dog to have a calm temperament. On completion of the donation your dog will be provided with cuddles and delicious treats. What happens to the blood donation? One life saving donation from your dog will help treat and potentially save the lives of up to three other pets. Your dog could donate for a maximum of four times per year. Before completing the form, please confirm your dog meets the following criteria. Between 1 and 5 years of age? 25kg or more in weight? Up-to-date with vaccinations and parasite control? Healthy with a calm temperament? Available to donate for up to four times a year? For more information, to chat to someone about donating or to sign up your dog to be a lifesaving blood donor contact U-Vet Canine Blood Donor Program on (03) 9731 2328 or complete Canine Blood Donor Enquiry Form below. The U-Vet Feline Blood Donor Program is now in urgent need of cat donors. Cats require emergency blood transfusions in the same way as humans and dogs do. If a cat loses blood due to trauma, becomes anaemic, undergoes major surgery or has cancer, it may require a blood transfusion to survive. Time is critical when in need for a life-saving blood transfusion and having blood products readily available may make all the difference. The U-Vet Werribee Animal Hospital is now capable of storing cat blood for immediate use in an emergency. The U-Vet Feline Blood Donor Program accepts blood donations from pets that are volunteered by their owners. To determine if your pet is healthy and eligible to donate we need to complete a full physical examination including a temperament test and comprehensive blood screening. The tests will verify whether your pet is healthy and in no danger to give a blood donation. Your cat will be admitted to the hospital for the day, where a sedative will be given and a blood donation will be collected from a vein in your cat’s neck. After the donation, your cat will monitored closely and placed on intravenous fluids. Once recovered, your cat will be provided with cuddles and tasty treats. What happens with the blood donation? Each donation is separated into two products: plasma and red blood cells. These are used to treat and save the lives of animals suffering trauma, anaemia or clotting problems. Red blood cells can be stored for 35 days and the plasma up to three years. One life saving donation from your cat will help treat and potentially save the lives of up to two other pets. Your cat can donate for a maximum of four donations per year. Before completing the form, please confirm your cat meets the following criteria. 4kg or more in weight? Not a blood transfusion recipient? For more information or to sign up your cat to be a lifesaving blood donor, contact U-Vet Blood Donor Program on (03) 9731 2328 or complete Feline Blood Donor Enquiry Form below. Meet the utterly gorgeous Mopane who is a Staghound cross and our star donor. Mopane wags her tail the entire time she is donating; she is a real treasure. To date Mopane has donated 11 times: that’s potentially 33 lives saved! Thanks Mopane – we couldn’t do it without you. Say hello and thank you to Truman the lovely labrador. What a trooper at 6 years old! He has donated 6 times and we hope to make that a few more before retirement. Truman is a true gentleman, loving his visits to the Blood Donor Program. Handsome James is a most-willing 3-year-old tabby and white domestic short hair. He is always keen to come in to donate blood for fellow felines in need. James loves the cuddles and attention he gets throughout the process, as well as the tasty treats following donation. 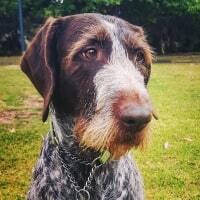 This is the adorable Skyler who is a German wirehaired pointer. Skyler is extremely generous and has donated 9 times so far. She is always willing to help her fellow canines. Skyler is an absolute delight to have in the clinic! Greetings Paddington; our cuddly-bear who is a 2-year-old German shepherd cross. Paddington is passionate about giving blood donations and has provided blood 4 times so far. We are looking forward to seeing Paddington again soon. Callie is a 5-year-old tabby and white domestic short hair, and is U-Vet’s Blood Donor program Queen of the castle! She has already donated for her second time recently, potentially saving the lives of 4 other cats! We look forward to a long and fruitful association with Callie. 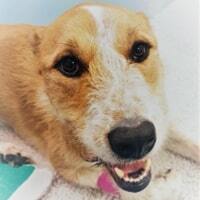 Meet the wonderful Border Collie, Archie, who is a regular at The Blood Donor Program. Archie donates his time, blood and beautiful attitude regularly and to date has donated enough blood to potentially save 21 dogs lives! Thank you, Archie, you are amazing! 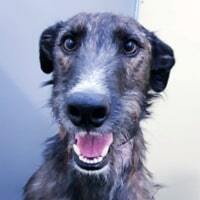 Jed is a 3 year old staghound cross who has potentially helped 15 dogs in need of lifesaving blood transfusions, with his five donations. It is a joy to have Jed as a donor! Meet the amazingly compliant (especially for a tortoiseshell) domestic short hair, Arrabell. She recently joined our team of feline life savers and did an awesome job! We’re looking for more feline donors just like Arrabell. 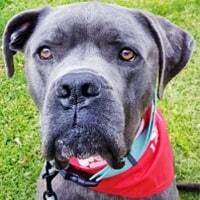 Beautiful Baloo, an Italian Mastiff, is a hugely enthusiastic 4 year old. He is always excited about helping critically ill patients in their hour of need. Baloo loves his treats and cuddles following his blood donations. Keep up the good work Baloo! Affectionately known as Dot, our dreamy grey and white domestic medium hair is a new inclusion to our lifesaving Feline Blood donor brigade. At just one-and-a-half years old, Dot has every possibility of saving many feline lives going forward. Purrfect! Lovely, laid-back tabby and white Linus is an old hand at donating blood. He has saved 3 lives already! Thanks for the huge contribution Linus. We’re relying on you to show the young ‘uns how it’s done!